Convenient and versatile, made with natural flavors and fully seasoned. Consistant performance and exceptional value. Try our Cream of Spinach Soup recipe! 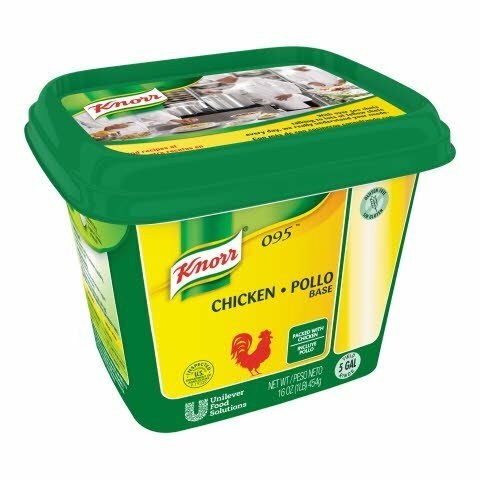 CHICKEN SOUP: Add the contents of this container to 5 gallons of boiling water and serve. For smaller quantities, add 4 ounces of 1/3 measuring cup to 5 quarts of boiling water. For individual servings, and 1 level teaspoon to 1 measuring cup of boiling water. Add other ingredients as desired. OTHER SOUPS: To soup prepared as above, add desired amount of well drained, cooked egg noodles or cooked rice. To prepare cream of chicken soup, add desired amount of LeGoût® 095™ Chicken Base added to your own chicken stock will give extra enrichment and superb flavor. Blend in a small amount for extra fine flavor in chicken a la king, croquettes, fricassee, creamed chicken, gravies, sauces, creamed soups, chicken and turkey dressings, chicken and turkey salads, biscuits, vegetables, meat loaves and many other foods.